Thinking of Nepal, most people think Everest with its snow covered peaks, Sherpas, and dominant trekking adventurers — that was largely how I pictured it anyway. 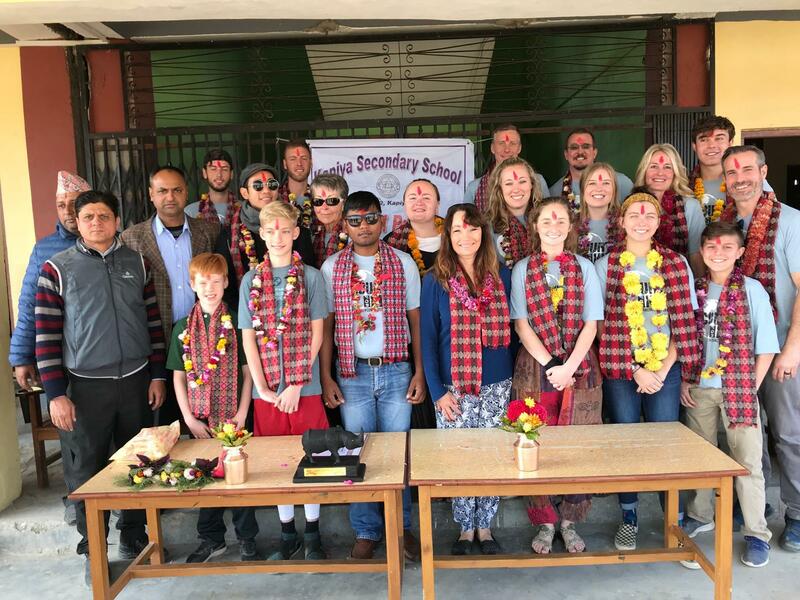 There is so much more to Nepal and its people and culture than Everest; something we learned and were so very humbled by over the course of this Courts for Kids adventure. This country and its people are awe-inspiring and I can’t wait to tell you about this journey. Slightly different then the closed trips, the family adventures allow for different flight options for those involved. This unique situation allowed for some really intense and deeply valuable relationship and family-like connections to develop and thrive. Immigration anyone? ?… we were faced with some unforeseen troubles. With everyone arriving on different flights, we were thrilled to arrived at the Dream City Hotel in Kathmandu; for most of us, it had been almost 2 days of travel just to arrive in Kathmandu. The drive from the airport to the hotel was nothing if not a complete launch into a foreign culture complete with its very own and obviously unspoken driving rules, a language which took some time to even grasp a basic understanding for although there are nuances that suggest one could, over time, acclimate. The official greeting began at the Dream City Hotel reception and the team was officially together. We immediately knew we had a rock star group. Knowing full-well that the upcoming days of hard work and local living situation would allow us the outstanding opportunity to take in the local cuisine to its fullest, we went to a rather charming local joint that was a mixture of local cuisine combine with western options. It was a great welcome to the organized chaos that is Kathmandu and the beginning of a beautiful adventure. Once acquainted with our lovely hotel, it was time to leave and board the bus to our destination of Kapiya just outside Chitwan National Park. We would return to the Dream City after our successful court build. Although we all packed rather responsibly, the first challenge was hoisting all our luggage atop the transportation to our destination. Finally, that was complete and our journey for an unbeknownst amount of time began. Anywhere between 3-8 hours was the official schedule — traffic in Nepal is largely unpredictable which becomes understandable the longer you spend there. After most of us eventually fell asleep for portions of the journey, seeming to last only a little over 5 hours, we arrived in the lovely Chitwan area. Being as late in the day as it was, we were not going to be able to get started on the concrete pouring, so off to settle in at the Chitwan Park Cottage hotel. Generally, home stays are the preferred accommodations for Courts for Kids stay so the full immersion piece is experienced by all, however under the circumstances and vast distances between homes, we were given the hotel as the best way for all of us to stay in one place. Rather humble accommodations, however, pretty comfy all things considered. Keep in mind, the term ‘hotel’ is relative. Simply have a badminton court was enough to thrill me. With each small room named affectionately after an animal known to the region and the surrounding national park, this hotel had some serious charm and would eventually feel like home. We all couldn’t wait to meet the community and see the spot we were going to spend the next week pouring concrete and with any luck, playing all the sports on. So although quite tired, we all headed off to the short drive over to the school to meet the community. I will never forget the experience of our van/car pulling into the school and having everyone come running up to the van and the excitement and warmth and embrace we felt. They were waiting for us and it was so incredible… photos do a pretty good job at capturing that moment which I know we all will cherish forever. Day one of the court build was pretty exciting for most of us. The temperature differences here in Nepal are quite striking. We all woke up freezing but by 11am, all layers began to come off as it was actually quite hot. The beginning of the first day of any court build, the contractors and head community members are working out all the kinks, so the quickest way to break the ice and get to know all these kids is usually one of two things. Sports, cultural games or a dance off. All went down this inaugural morning including a long jump competition and it was incredible to see the beginnings of friendships with the community that were only going to blossom over the next week. It really was a great start. By afternoon, we were thrilled that we had a working mixer, like a real motorized version, my previous experience had been with a hand mixer, a far more laborious process. This was good news. Once the machine was fired up and we all rallied to find our place in the process, I was surprised to look around to see no actual wheelbarrows? So, were we going to use to get the concrete from the mixer to the court? To my surprise, there were something we called “pans.” This to me was pretty inconceivable that we would be able to use these pans with a conveyor line of people to build this court at any reasonable pace. However, that is what we had on day 1, and that is what we used, ultimately pretty successfully in completing almost a third of the court that afternoon. Shows how little I know. A shout out has to go out to the wonderful community members who were so very gracious in cooking us traditional and absolutely delicious lunch everyday at the court. The food was absolutely incredible and the ease of which they could cook for a group this large was really fun to see. Their fire building skills were mesmerizing and a skill I hoped to bring back to my mini fire-pit back home. By day 2, we had begun a morning stretch/ yoga routine to start the day. In an awesome turn of events, wheelbarrows were incorporated into the flow of things as well. By having both plates and wheelbarrows going at the same time with the help of so many wonderful community members and school children, we were able to complete the largest section of the court by day 2. The speed we were working at was pretty remarkable. Something I had never seen before was implemented as a rather brilliant assistance to the main mixer un-loader (without question the most difficult task), a shovel assist. There was a rope tied around the shovel so in essence, you would have two times the strength in shoveling the concrete into wheelbarrows or pans. A much more effective and less back-breaking work. It worked surprisingly well when you got into a good rhythm. Throughout this work, the team and the community were getting so close. We truly are so much similar than we are different. The desire to connect is always there and the kindness and hard work needed to pull off this incredible accomplishment for the school was there in abundance. The community members were so present and enthusiastic; we had more than enough hands to successfully complete this court in three-days, the last day, being the most challenging by far and quite humbling. Ultimately it was worth the extra effort to finish late that evening. We had a large New Year’s celebration to look forward to and a grateful heart that evening at dinner, knowing that an early court completion meant a mini basketball camp and tournament in two days. Playing basketball with the locals, whom some had never played before was such a treat and something we were all looking forward to. It didn’t disappoint. Everyone took quickly to the basketball camp and we all split up into teams to begin a tournament. Most of the competitive spirit of some of us, took a backseat, a lesson to step back and enjoy sharing such an important experience instead of simply finding value in winning. It was a huge success and truly a memorable day. New Year’s Celebration was incredible. Being invited to a local community where they prepared a wonderful dinner with their finest ingredients, was such a heartwarming gesture and something I will never forget. We were treated to some amazing local cuisine, traditional dancing, and wonderful stories. We in turn provided a unique little dance off to enter into the New Year which seemed to at least amuse the locals. For us it was a wonderful end to 2018 and a great way to start this exciting new year! Saying goodbye to the community was one of the hardest things. We had grown so close and felt like we were a part of the family in Kapiya. There were lots of hugs and running after our bus as we departed. Social media, although less prolific in Nepal, is a way for us to keep in touch with the community which is really quite wonderful for all of us to keep abreast of how our lives are progressing and to encourage each other moving forward. Tiger sighting which ran just between our two vehicles. But seeing a Rhino on the walking portion of the tour was pretty incredible. A memory I will have forever.